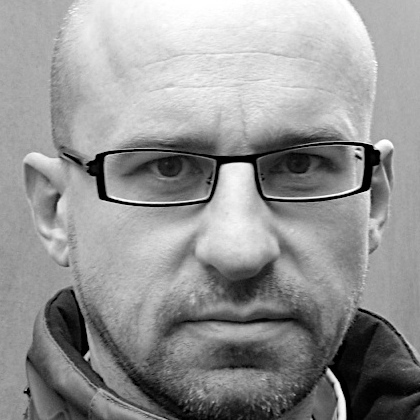 Piotr Gwiazda is a literary scholar, translator, and poet. He is the author of two critical studies, US Poetry in the Age of Empire, 1979-2012 (Palgrave Macmillan, 2014) and James Merrill and W.H. Auden: Homosexuality and Poetic Influence (Palgrave Macmillan, 2007). He is the translator of two books by Polish writer Grzegorz Wróblewski, Zero Visibility (Phoneme Media, 2017) and Kopenhaga (Zephyr Press, 2013). Gwiazda has also published three volumes of poetry: Aspects of Strangers (Moria Books, 2015), Messages: Poems & Interview (Pond Road Press, 2012), and Gagarin Street (winner of the Washington Writers’ Publishing House Poetry Contest, 2005). Gwiazda’s essays, reviews, translations, and poems have appeared in many journals, including AGNI, Antioch Review, Asymptote, Barrow Street, Barzakh, The Brooklyn Rail, Chicago Review, Colorado Review, Contemporary Literature, Copper Nickel, Denver Quarterly, Drunken Boat, Granta, Hotel Amerika, Jacket, Jacket2, Journal of European Studies, Journal of Modern Literature, Laurel Review, Mantis, Modern Philology, Modernism/Modernity, The Nation, Past Simple, Pleiades, PN Review, Poetry Salzburg Review, Postmodern Culture, Prelude, Rain Taxi Review of Books, The Seattle Review, Seneca Review, Smartish Pace, 6×6, The Southern Review, Talisman, the TLS, Translation Review, Tripwire, The Wolf, and XCP: Cross Cultural Poetics. Gwiazda is a Professor of English at the University of Pittsburgh. He has received grants and fellowships from the PEN American Center (Translation Fund), National Humanities Center (Summer Institute in Literary Studies), Andrew W. Mellon Foundation, and the Dresher Center for the Humanities at the University of Maryland Baltimore County (UMBC). In the fall of 2008 he was a Writer-in-Residence at the James Merrill House in Stonington, Connecticut. In 2012-2014 he was a Visiting Scholar at the Humanities Center of the University of Pittsburgh. He has read his work on NPR and was featured in 60 Writers/60 Places, a film by Luca Dipierro and Michael Kimball (2009).